In our present uncertain environment, it is becoming increasingly important to build our ‘transferable skills’ for our future employability, adaptability and occupational mobility. The amount of economic restructuring presently underway will require a far more flexible workforce in the future that needs to have a wide range of transferable skills. Knowing what and where it will be is valued is becoming important for all of us to understand. The background to this report is the increasing concerns within the EU as to how to improve its competitiveness and redirect the European economy towards higher added value to generate new and better jobs. This increasingly relies upon a more strategic management of human resources. For me innovation will be a leading driver of this job and growth generation so in obtaining a deeper understanding of the present thinking in this area of skills is important one to my work on building future capabilities and capacity for innovation for my present and future clients. The part people play and the skill set they will need are crucial for innovation’s health. Clearly we are facing continual adaptation and the consistent search for adding value, not just to what we sell but also to what we have available in resources to exploit it. This report helps in reinforcing where skills fit, front and centre, to any future growth and job creation. There is a lack of consistent theory for defining and classifying various skills, and there is no generally accepted skills taxonomy. The project team thus decided to distinguish three categories of skills on the basis of previous analysis: 1)soft skills; 2) generic hard skills; 3)specific hard skills. 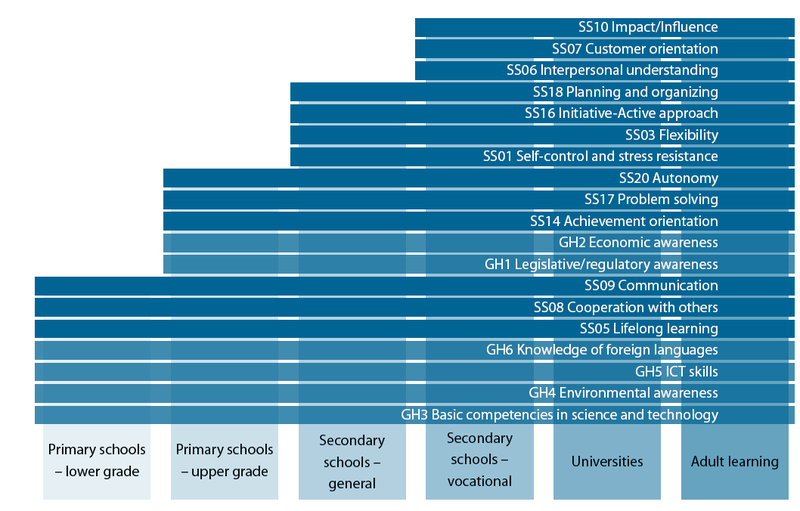 Skills Taxonomy By Transferability- source: European Union 2011 report. Specific hard skills are characterised by their lower level of transferability, whereas soft skills and generic hard skills are skills with high transferability across sectors and occupations and can be identified as transversal skills. My focus here is the soft skills within transversal skills that support innovation activity. Transversal skills that range from problem solving to interpersonal skills are considered as important for innovation. Having these skills, which can be transferred from one context to another, is a good basis for accumulation of specific skills required by a given job expected in managing a robust innovation pipeline and portfolio to deliver new growth opportunities. Self-control and stress resistance; Self-confidence; Flexibility; Creativity; Lifelong learning. These skills reflect some aspects of an individual’s maturity in relation to himself/herself, to others and to work. They are related to performance of an individual when dealing with environmental pressures and difficulties. Interpersonal understanding; Customer orientation; Cooperation with others; Communication. These skills enable people to understand the needs of others and to cooperate with them. Communication skills are linked to all clusters and they are included in this one because of their important role in relationship building and communication with others. Impact/Influence; Organisational awareness; Leadership; Development of others. Skills in this cluster reflect an individual’s influence on others. Managerial competencies are a special subset of this cluster. Achievement orientation, efficiency; Concern for order, quality, accuracy; Initiative, proactive approach; Problem solving; Planning and organisation; Information exploring and managing; Autonomy. The essence of this cluster is a tendency towards action, directed more at task accomplishments than impact on other people. Analytical thinking; Conceptual thinking. These two skills reflect an individual’s cognitive processes – how a person thinks, analyses, reasons, plans, thinks critically, identifies problems and situations and formulates explanations, hypotheses or concepts. Although all skills, to some degree, can be transferred across jobs but it is these ‘softer’ skills, the transversal ones are seemingly valued as having a more important impact on success in life and certainly for working within and across innovation activities. Distinguishing between hard and soft skills is important to achieve. We all understand, sometimes frustratingly so, that Employers tend to distinguish the hard skills such as job-specific skills closely connected with knowledge as they are far more easily observed and/or measured and can be specifically trained. Having these ‘hard skills’ can be overly rewarded due to this ability to measure more easily and then reinforced, often to the determent of innovation that needs a healthy mix of all skills. Today thankfully there is a push that we do recognize and require more of a better mix of T-shaped occupational skills profiles. Whereas soft skills such as non-job specific skills which are more closely connected with attitudes and necessary for innovation, that ‘can do’ aspect are far more intangible, and difficult to quantify and develop. Recognition and assessment of transversal skills in new hires is also more difficult also and getting to understand these softer skills and within this report they lay out a suggested roadmap to build this more into the educational system and should be supported by specific systems, methods and tools. I find this suggested roadmap discussed within the report as helpful but it is for the longer term. What can we do in the short to medium term? There is increasing need for organizations and professional bodies to undertake a talent identification and development study, perhaps by using this suggested taxonomy and report as a base. We do need to think through the ways to build into our training more of a transversal skill emphasis and talk more openly about these as increasingly needed for skill-related work within a networked economy where the softer skills are increasingly seen as important to have available. I found this report a valuable read- it helps my thinking and ongoing work. This report I found as a valuable read, it is part of the wider social agenda for modernizing Europe and along with the comprehensive sector studies the EU is mapping and evaluating the evolution of innovation, skills and jobs to begin to anticipate the needs emerging from the current restructuring being undertaken. They see worrying signs of skill decline and a high increased demand for high skilled jobs, with service continuing to grow in importance. All of this will require new types and mixes of employees and skill development within itself is going to be a crucial challenge. We do need to manage and know what different skills do impact innovation activity; I think this report helps in this. It certainly provides a clearer structure for my work in supporting organizations ability to build up their innovation capabilities and competencies. 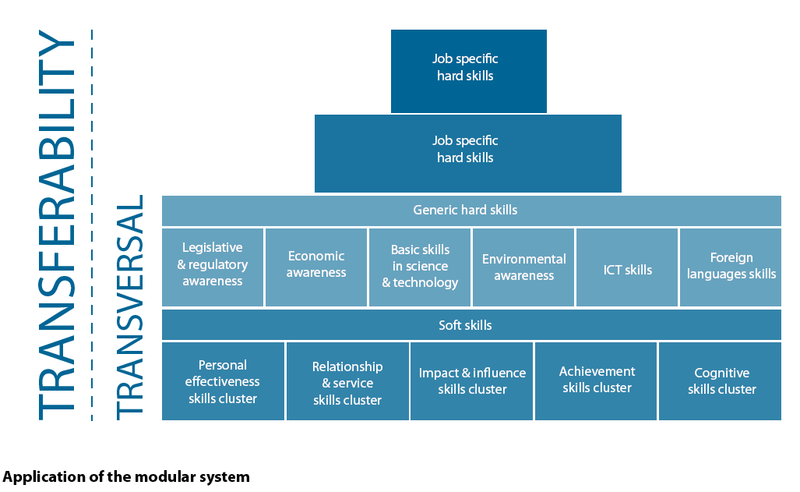 This entry was posted in Molecules and tagged distinguishing between hard and soft skills, EU report on skills, innovation skills needed, Innovation taxonomy, skill roadmap, skills taxonomy, soft skills within innovation, transversal skills for innovation. Bookmark the permalink. ← Designing appropriate tension into the innovation process. This is an interesting and comprehensive taxonomy of a critically important DISCIPLINE of the 21st Century that must be applied to all fields of knowledge. I am a quality management specialist and leadership mentor and I actively and extensible train people in Soft/People Skills previously as a necessary condition for success to reach “sustainable quality” in business and education.